The Nano is a development board equipped with Nordic’s nRF51822 Bluetooth Low Energy SOC. This board is available on RedBear Store . nRF51 BLE Nano has two external oscillators. The frequency of the slow clock is 32.768 kHz. The frequency of the main clock is 16 MHz. The DAPLink USB board acts as a dongle. DAPLink debug probes appear on the host computer as a USB disk. It also regulates 5V from USB to 3.3V via the onboard LDO to power Nano. More information about Nano and DAPLink can be found at the RedBear Github . Applications for the nrf51_blenano board configuration can be built and flashed in the usual way (see Build an Application and Run an Application for more details). 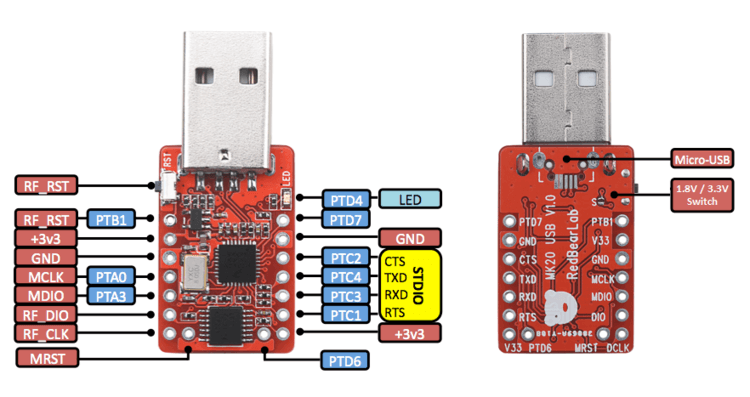 To flash an application, you’ll need to connect your BLE Nano with the DAPLink board, then attach that to your computer via USB. Be careful to mount the BLE Nano correctly! The side of the board with the VIN and GND pins should face towards the USB connector. The RedBear Store  page links to a tutorial video that shows how to properly solder headers and assemble the DAPLink and BLE Nano boards. After mounting the BLE Nano on its DAPLink board as described above, you can debug an application in the usual way. Here is an example for the Hello World application.